Dill is native to the eastern Mediterranean region and western Asia. Dill seeds can be used crushed or ground or incorporated whole at an earlier stage as heat actually brings out the flavor. Dill seed isn’t actually a seed but is the flat, oval, dark brown whole fruits of the herb dill. The term “dill weed” refers to the green leaves (and sometimes stems) of the plant. Dill is a tall, flowering plant in the carrot family that is known for its flavorful foliage and seed. As a general guide, when I want to cut something that may otherwise be overly rich, I reach for pungent dill seeds. On the flipside, they’re perfect for covering up funky, undesirably flavors. This is an Old World spice just waiting for some New World applications. 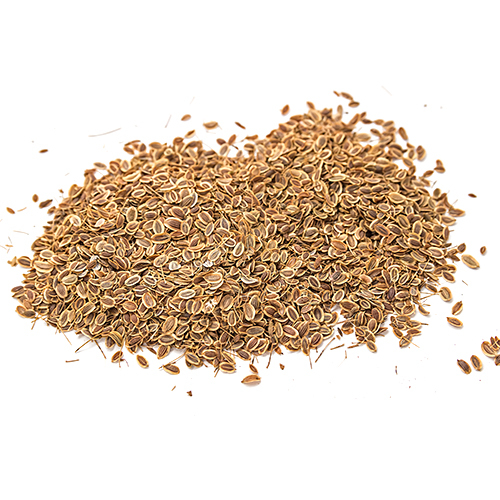 Dill seed is a staple in eastern European cuisine, where it is used to flavor breads, vegetables, braised meats and soups, such as the classic Russian cabbage-based soup called borsch. Dill seeds provide the strongest flavor by far. They can also be used to make a unique herb bread, flavored vinegar, and can even be added in small quantities to desserts, particularly those containing apples. Dill seed performs equally well in soups and braised dishes, especially with meaty eggplant or cruciferous vegetables like cabbage. Try dill seeds in pickle brines for cucumbers, beets, and carrots. Dill cultivation requires warm to hot summers with high sunshine levels; even partial shade will reduce the yield substantially. The seeds are viable for three to ten years. The seed is harvested by cutting the flower heads off the stalks when the seed is beginning to ripen. The seed heads are placed upside down in a paper bag and left in a warm, dry place for a week.